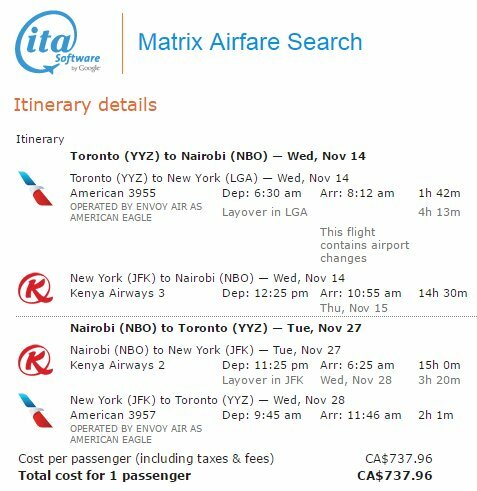 American Airlines and Kenya Airways are showing flights from Toronto to Nairobi, Kenya for $735 CAD roundtrip including taxes. 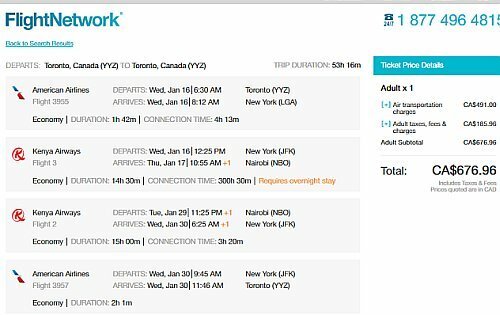 This is 30% below the typical best prices for a roundtrip flight from Toronto to Nairobi. However, the flights do have an airport change in New York City on the way there. You have 4 hours to transfer yourself between LaGuardia airport (LGA) and John F Kennedy airport (JFK). Here are some links with info on transferring between LGA and JFK. Quora - How much time does it take to switch from JFK to LGA airport in New York? Rick Steves - Is 4 hours adequate time to transfer from New York Laguardia to JFK? 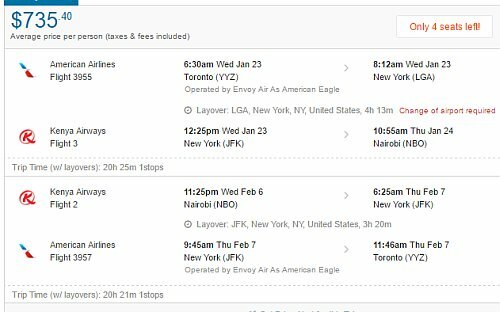 The legs between New York City (JFK) and Nairobi (NBO) are a new route for Kenya Airways, who will be using a 787-8 Dreamliner. Departing: choose a departure date in November, January, or February. I would recommend trying a Monday, Wednesday, or Thursday. 4. On the next page, you'll see a calendar. Hopefully you'll see some dates that are $738. If not, you may want to try a different departure date. (Note: I've found that you need to start from the front page of the ITA Matrix website when trying another date, or it may not work). Click on one of the $738 dates. 5. Now you'll see a page with a list of flight options. On this final page, you need to select everything on the page. The easiest way to do this in your browser is by hitting CTL-A. Once you have everything selected, hit CTL-C to copy. Hit CTL-V to paste your itinerary. 8. Book With Matrix should now attempt to show you somewhere that you can book this flight on these dates. Be aware that certain sites that they may send you to, such as Priceline, are in $USD. 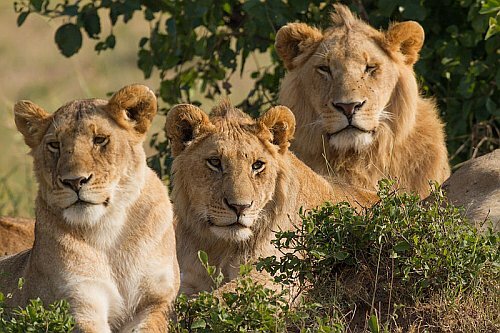 Update 6/22 - These flights from Toronto to Nairobi, Kenya are now available for even less: $676 CAD roundtrip including taxes. There are also now March, April, and May 2019 dates available. - Use the 'ITA Matrix' method and steps described in the section above. - The only difference is that now the prices are even lower, and there are more dates available. toronto, yyz, flight deals, american airlines, nairobi, kenya, nbo, africa, eastern africa and kenya airways. 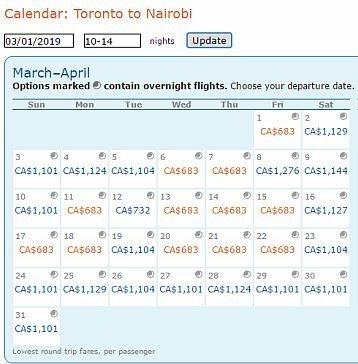 6 Responses to "Toronto to Nairobi, Kenya - $676 CAD roundtrip including taxes"
Wonderful news .Can you accommodate longer periods stay in kenya at this price. Bought! 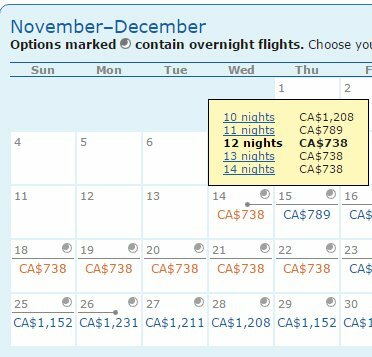 Found (using ITA Matrix) alternate dates of Jan 3 to Feb 28, and booked directly from American Airlines by pasting data into BookWithMatrix.com (and paying via Paypal to get around US address requirement). I just got back from Mongolia ( http://www.yyzdeals.com/toronto-to-ulan-bator-mongolia-794-cad-roundtrip-including-taxes ). You're killing me. Hi Beatrice, for longer trips, you may want to try mixing and matching dates from different lines in the list of dates provided. Or you could try the tip that Paul provided. Great tip Paul, thanks! Welcome back from Mongolia. I added some info to the blog post about using ITA Matrix to potentially find more dates. 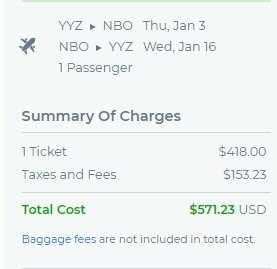 american would give me for the inbound dates was a yyz->lga flight with a 4 hour transfer to jfk, i'll book that leg separately. No problem Ivan, thanks for sharing what you found. Have a great trip!